Here in New England, Mother Nature is up to her old tricks again. We had a couple of weeks after the holidays of decent weather where it wasn't biting cold and we didn't have much in the way of snow or freezing rain. I'd just started thinking we were through the worst of it. Then, she layed it on thick, with a few good windy storms, some heavy precipitation, and a couple of nights where it felt like 10 below with the wind-chill factor. Nothing fights back at the winter cold quite like a steaming-hot bowl of soup, chowder, or stew. Soup is one of those wonderful things that I look forward to making each year as the weather gets colder. There's just something special, rustic, and homey about it. I thought I'd share one of my basic recipes for soup today. Make yourself a batch, ladle-out a big coffee mug of it, and curl-up on the couch with a good book. Enjoy! 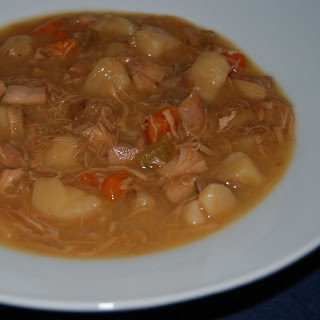 This quick and easy recipe is a great base for what I like to call "refrigerator soup." You can easily clean out the fridge and toss in any veggie leftovers and it'll taste great and be relatively healthy. It's an incredibly flexible soup. Play around with it and enjoy! 1) Pre-cook pasta according to package directions. Rinse and cool. 2) Peel and chop carrots and onions into chunky pieces that are similar in size and will fit on a spoon. 3) Clean and slice celery stalks cross-ways into spoon-sized slices. 4) Heat a heavy-bottom pot on medium-high heat with just enough oil to coat the bottom of the pan. Add onions, carrots, and celery. Stir, cooking until veggies start to soften but do not brown. Adjust heat as necessary. This is an important step for flavor...don't skip it! 5) Add chicken broth, water, tomatoes, and beans. Cover and bring to a boil. Reduce to gently bubbling simmer. Cook until the beans soften slightly and carrots are cooked through. 6) Reduce to a slow simmer. Add chicken and cooked pasta. Simmer 3-5 minutes and serve.